Buy the Super Value for Money Valken Annex MI 9 Mask at Amazon, here. The Valken Annex has a lot to impress you with, especially when making you pay only $50 for it. 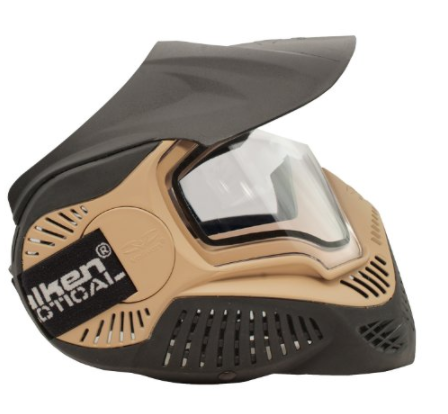 Features like scratch protection, collapsible bottom skirting and a visor are typically not features that you will see in a $50 mask. The lens change out is excellent on this mask and all you will need is a quarter or any other coin. 30 seconds to pull out the lens and another 30 seconds to pop new ones in. The lens change out is going to be useful as the mask does tend to fog after a few hours of use. Or, it fogs when you breathe very heavily into it or play in very hot weather. But, by picking up a couple of lenses for about $30 to $40 more, you essentially have a brand new mask every 1 or 2 hours should you want, thanks to the cool $50 starting price point of this mask. The lens gives you 160° of vertical vision and 260° of horizontal vision, resulting in a great field of vision. 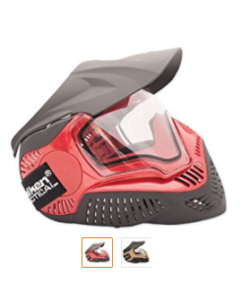 There are not a lot of starter masks or budget paintball masks that offer this level of spectrum when it comes to field of vision. They are quite similar to the Valken MI 7, with the major difference being that the older MI 7 doesn’t feature a collapsible bottom. To conclude, the Valken MI 9 is a fantastic mask with both great performance and comfort. It comes in a nice little box that you can use to store it safely, when not using it out on the field. At $50, there’s not many masks that can beat out this mask in terms of the performance and comfort features on offer. Buy the Valken Annex MI 9 in Red or an exciting tan color at Amazon, here.